Spider-Man: Into the Spider-Verse has two things we love: Spidey and comedian John Mulaney. The Marvel and SONY Studios animated blockbuster was a sleeper hit and is now nominated for an Oscar: Best Animated Film. It’s domestic total as of January 27, 2019 is $169,040,116. It’s staying power became apparent around Christmas when Spider-Man: Into the Spider-Verse saw its domestic weekend box office grow from the pre-Christmas to the post-Christmas frame. 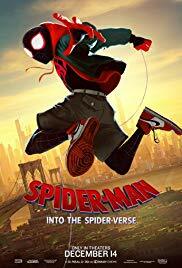 “With so many other huge movies out there right now competing for consumers’ wallets, it would be easy for Spider-Verse to get lost in the shuffle” said Cinemablend on January 2, 2019. Spider-Verse, which posted the best-ever December opening for an animated film, is not only Spidey’s fresh translation, but its larger message of including the other. “This film is subversive and self-referential and meta — and funny! There’s so much ridiculous and wonderfully silly comedy in the movie — but what makes it work is that it’s profoundly emotional. It has a giant beating heart about these very diverse and lonely Spidermen from their different homes in the Spider-verse coming together to meet each other,” Kristine Belson, Sony Pictures Animation president, told Variety. She points to the film’s oft-repeated tagline [which came from co-creator Stan Lee]: anyone can wear the mask. In the film multiple versions of Spider-Man from alternate parallel universes meet including Peter Porker: The Amazing Spider-Ham (voiced by Mulaney). Mulaney talked to Jimmy Fallon about his super secretive and profanity-laced outtakes while voicing Spider-Ham on The Tonight Show. And from Anatomy of a Scene over at the New York Times check out the directors of the Oscar-nominated film discussing the spider-bite sequence that changes everything for its main character, Miles Morales. A sequel to Spider-Man: Into the Spider-Versehas also already been announced.